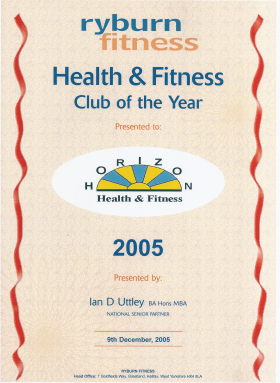 Horizon were voted best in the UK by a company that had, at that time, only awarded four top honours in 15 years. 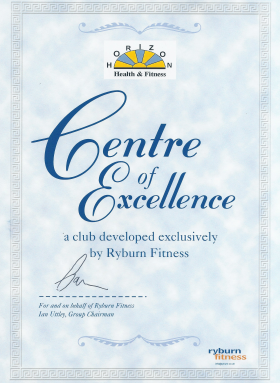 According to Ian Uttley, boss of Ryburn Fitness who made the award, it left the rest standing. Ryburn regularly run the rule over private health clubs like Horizon in a bid to find the best. Horizon is family orientated, owned and run by David. And the hands-on involvement was one of the reasons why the top honour came to Horizon. Also helping clinch the award was the way David’s overall dedication to the health and fitness of local people. Ian was also impressed with the gym’s phenomenal growth over the last two years and the investment in such high tech equipment as Air Machines. Plus the enthusiasm shown in inspiring people in general to improve their fitness levels. David is delighted by the accolade which they believe shows that Horizon can take on and beat anyone nationally.